Adrien Blosse aka Noctis is a multi-instrumentalist whom you might know from his Black Metal solo-outfits Alkymist, Blosse and Calvaire, or from his activities in Maeskyyrn. He’s also the guy behind Nachteule (‘night owl’), which he started in 2016. He wrote and recorded some material throughout the two past years, among which a first full length (Vaste Inconnu, June 2017, released on cassette via Corde Raide Productions) or a split-CD with Polish finest Nyctophilia (Wolfspell Records, July 2017; actually this was sort of a re-release of the 2016 demo). 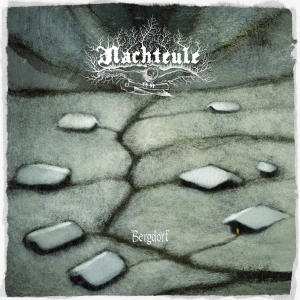 On December 21st 2018, Wolfspell Records released a modest yet highly interesting batch of recordings, and amongst this package is the sophomore full length of Nachteule, Bergdorf. Bergdorf (German for mountain village) consists of an intro and four lengthy compositions (in between six and eleven minutes), and it was initially released digitally by the project itself at the end of Summer 2018. Wolfspell Records from Poland takes care of a physical release, being a compact disc, digipack with booklet, in an edition limited to 300 copies. The unusual yet intriguing cover artwork, by the way, was done by Benjamin König from Sperber Illustrationen. The short intro is a piece of acoustic elegance, somewhat folkish and not that unhappy actually. But it is as from Autour Du Foyer Rouge (around the red fireplace) that the ‘real thing’ happens. The four ‘real’ compositions bring a very dark-atmospheric form of classic Black Metal with a desolate, melancholic twist. The latter especially gets caused by the ultimately fine, semi-mesmerizing guitar leads and transcendental melodies, and in some way it does not stand that far away from the DSBM-trend, yet without the depressive of suicidal basic. These tremolo riffs with a so-called black-gazing (Blackened Shoegaze, you know…) attitude, get accompanied by a heavy and droning rhythm section and icy, almost sulphurous screams. There is quite some variation in speed, with mainly faster excerpts, and everything gets permanently injected by grandiose additions, like epic and / or desperate acoustics, floating passages with synth (cf. the last moments of the title track, for example), sudden outbursts of malignancy and heroism, and samples from Mother Nature once in a while. Les Yeux De La Fôret (the eyes of the forest) also comes with a flute passage, by the way. The variation in between the different passages, including the diversity in structure and tempo, are of a high quality, making it less uncomfortable to ‘enjoy’ these lengthy hymns. Since there is a permanent arousal going on, the whole album catches (no, it is not a catchy album – that’s something quite different!). The several acoustic passages (used as in- and outro, as intermezzo, or simply used as addition within heavier passages) have an organic flair, showing a close connection with Mater Terra and our beautiful nature (not man’s corrupt nature, yet the plants, the beasts, the forests, the birds, water and fertile soil, nightly creatures and the spirits of wind and fire – oops, I was about to turn into a poetic melancholia…; but you know what I mean, I think…). In contrast, yet not in contradiction, are the heavy passages; the essence of bleak and forceful Black Metal, sort of timeless and somewhat old styled. A word about the sound is needed, for this could be a turn-off. I do not think you would expect a surgically-clean production, evidently, but this album is quite noisy and unpolished for sure. Especially within the mix, I am afraid you might miss some details. But then again, it is not that bad either (yet as a reviewer I have to be honest), for it does strengthen the down-earthed and mysterious atmosphere that characterises Bergdorf.